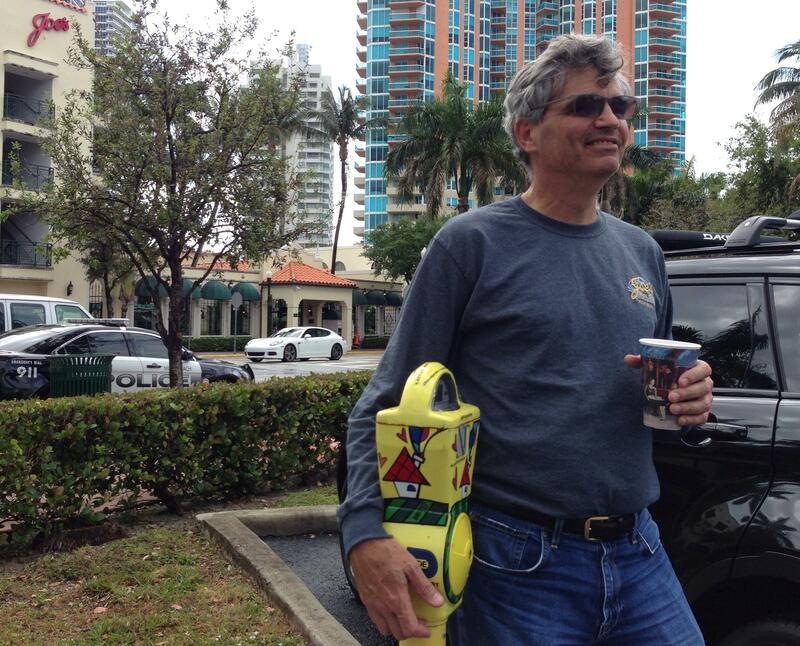 Stephen Sawitz with one of his "Britto meters" in the parking lot of Joe's Stone Crab. Click here to listen to the "Britto meters" in action. It's one of Miami Dade County’s so-called “Britto meters,” which provide a way for people to donate money to help the homeless without having to give to panhandlers -- a type of donation box. So far the project has raised $34,000 for the Miami-Dade Homeless Trust, which sounds great until you realize at least some of that money comes from people like Rolle. “I thought I was paying for parking. I don’t understand, what are they collecting money for?” asks Rolle. The money goes to a designated account overseen by the Miami-Dade Homeless Trust, making sure it pays for things like beds and services as opposed to salaries and administrative fees. Romero Britto's "slap you in the face" design for the meters. Three years after this project launched, people don’t get it. And this is an attempt at a clearer version of the idea. The “homeless meter” concept is not unique to Miami. Ron Book, chair of the Homeless Trust, first saw the meters in action in Denver. Specifically a slap delivered by pop-artist Romero Britto, who agreed to design Miami’s version. And Britto’s bright colors do help them stand out, especially in places like Government Center, where the meters are installed in the middle of a sidewalk. Even though you couldn’t park in front of it if you wanted to, the meter still works like a parking meter — 10 minutes per quarter. Like the confusion Rolle felt at Joe’s Stone Crab. Even Joe’s chief operating officer, Stephen Sawitz, thinks the meters are a bit confusing. “'Not for parking,' but what does that mean?” Sawitz asks, reading some of the fine print on one of the meters in his restaurant’s lot. 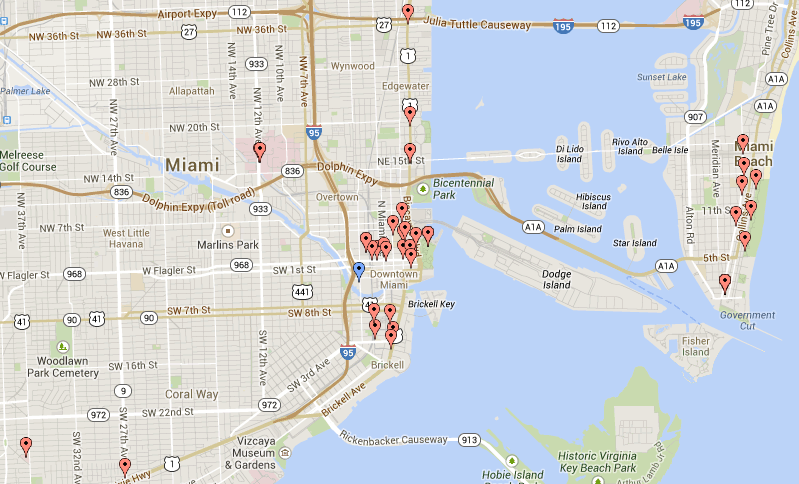 The location for some of the "Britto meters" around Miami-Dade County. He acknowledges that at least some of his customers accidentally donate money to the Homeless Trust. But he’s not too bothered about the confused generosity. As for the future of the program, Ron Book isn’t giving up -- in fact, it's kind of the opposite. He admits “slapping people in the face” with Romero Britto hasn’t worked perfectly, but he has a new solution: education by volume. “I think the more of them we get out there, the more of the message gets spread,” he explains. There are currently 85 Britto meters throughout the county. Increase that number by 600 percent, says Book, and people will start to get the idea. From this video below, it's clear they haven't yet. To see the location of all the "Britto meters" click here. WLRN is co-presenting the Power of Design Festival with the FIU-Wolfsonian museum. The theme is complaints. Stop by our complaints booth Saturday, March 22 at 1001 Washington Ave., Miami Beach 33139. You can find out more here. #WhatIsArt Project: Do You Know It When You See It? James Lature spends much of his time between North West 16th and 17th Streets behind the ACE Hardware store. It’s as close to home as it gets. Born in South Carolina and raised in Miami, he has spent the last 20 years getting to know the streets of the city by sleeping on them most nights.